When traveling to Miami, many tourists wish to visit the surrounding cities outside Miami. Each city holds a historic background which makes them relatively different. Nonetheless, the cities share two characteristics: hot humid weather and crystal- clear sandy beaches. Visiting South Florida cities is a very interesting thing to do in Miami; in fact, it is one of the best Miami attractions. If you want to make your travel way more productive and fun, you have to travel out of the greater Miami area. Several excursions and tours depart from Miami to other cities each day, including Hollywood, Fort Lauderdale, Orlando, Tampa, Naples, Boca Raton, and Key West. However, you can always rent a car and drive to the city of your preference. 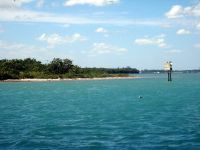 Miami-Info.com, your Miami travel guide, gives you the average distances between Miami and main South Florida cities to help you plan your trip in advance. Distances can help you choose the city that is better for you; you must take in consideration the length of your staying before making any decision because some of them are really close, but others are not. To estimate time, divide the distance mileage by 60. The result will give the approximate travel time; however, this tends to vary depending on weather and traffic flow on the road.